Back in August I wrote my first ever blog with the aim of maybe chatting about my artwork and possibly gaining comment. Since then I've not had a moment to do any painting, other than undercoat and gloss outside the house. However now this artistic endeavour in Dorset is at an end, and with the impending arrival of Christmas, it's time to once more think about my Christmas card. Re-reading my first paragraph is obviously my attempt to gain the most boring blog award. I'll wear the tank top and nylon scarf prize with pride!! 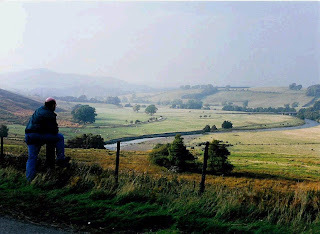 Watch this space then... there may be more, but until then I'll leave you with a veiw of the Coquet Valley in Northumberland, yours truly in pondorous mood, looking over his favourite view.